We all like weddings. They are days that create great memories and fantastic photos. Most people love the opportunity to dress up. Going out shopping for a wedding outfit is always fun and interesting. Often you end up trying on clothes you would not otherwise consider buying. As a result, you usually gain some extra insight into what clothes look great on you. It is a chance to experiment and shake things up a bit. A wedding forces you not to be lazy and just carry on buying the same style of clothes you always do. Naturally, you want to look your best, which means buying good quality clothes, which are expensive. If you are invited to several weddings in one year, being able to afford a complete new outfit for each of them can be impossible. Fortunately, there is a lot you can do to get around this problem. If you follow my tips, you can buy a good outfit that you can adapt and update throughout the year. That way you get a new look for each wedding without having to pay for a complete outfit each time. If you know for sure that you are going to be attending more than one wedding before you go out you have the chance to shop for both outfits together. With shops changing their range on six or 8-week cycles this is the wisest approach. If you do not do this, you run the risk that styles will change drastically between shopping trips. Should that happen, it will become more difficult to buy accessories that fit together nicely with the outfit you have bought. How you accessorise the outfit has a big impact on the overall look. Bear this in mind when choosing what you buy. You are looking for a dress, or maybe a suit, in a colour and fabric that is easy to match with different colour and styles of shoes, belts, scarves, handbags and hats. Choosing a classic cut improves your chances of being able to find the accessories you need. If you choose a radical look, your chances of being able to do this are reduced. Just as important is thinking about the kinds of weddings you will be attending during the year. A formal suit, in a luxurious fabric, may be perfect for a classy city wedding. Whereas, for a countryside wedding venue such as Heaton House Farm it won’t work so well. Another consideration is the weather. If you are attending a summer wedding, the chances are you will be fine in just a dress. But, if you want to wear that same dress to an autumn or winter wedding you will need a jacket or shawl. That is a good thing because you can choose one in a different fabric, which will make it far easier for you to give your outfit a fresh look. I'd love to have the excuse to get dressed up for a wedding, it's such fun, but I can't imagine when I'll next go to one, perhaps when my kids and their friends start getting married...eeek that's a thought! 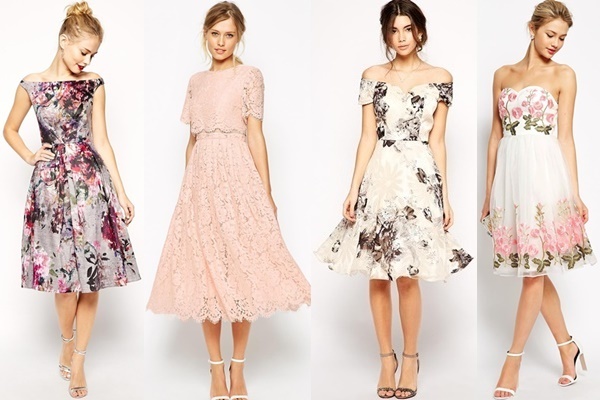 These are some gorgeous dresses. Thank you for the tips. These are fab tips, and I have two weddings to go to this year so it's a timely post! I always go for a 1950s style dress so love the first one in your image. So far no invites this year, last year we had a couple and I wore the same dress to both because I don't do smart unless it is a wedding and I wanted to get some wear out of my new frock! No weddings here either but sensible advice that I will try and remember on the first occasion I need to buy a fancy dress. I love the second dress. Sadly no wedding this year as the one we were going to has been postponed. Thanks for the tips, I've got a wedding in Italy this year and have no idea what to wear! I like all of them but particularly the peach one its so pretty.